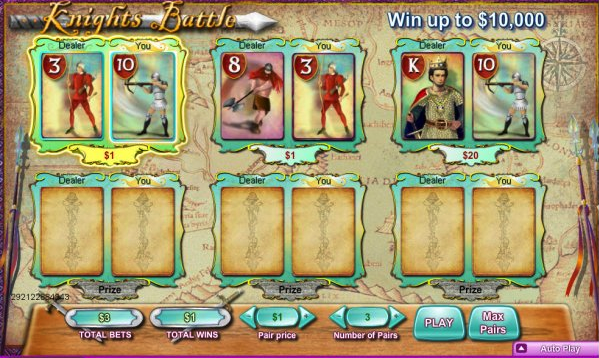 Available to play at an online casino near you, Knights Battle is something a little different from NeoGames for a Monday morning; it’s essentially a very basic card game with a sprinkling of scratchcards but it has an appealing theme influenced by various mediaeval role playing games. Check out the full review below for everything you need to know. Knights Battle is a card comparison game in which features six pairs of playing cards set against backdrop of a hand-drawn map which no doubt points the way to some battle location or buried treasure. The aim of Knights Battle is to reveal a higher card than the dealer’s for which you will win the amount under the little silver scratch panel below that pair of cards. The first thing to do is decide how many pairs of cards you want to play with using the controls beneath the game panel. This gives a betting range of between £0.20 to £120.00. Now press the ‘Play’ button and your selected pairs will be revealed, hopefully resulting in some wins. The scratch panels will be revealed either way just so you can see what you would have won (in a Jim Bowen voice). That’s all there is to it – it’s a nice simple concept enhanced by the theme and the scratchcard element and it’s well worth a go if you’re looking for something a bit different. NeoGames are something of a specialist when it comes to this type of game and it shows here.